Thousands of people have visited Ericsson Palace at Malé náměstí in Prague, including singer Dan Bárta. They have all come to see an exhibition by artists Luka Brase and Jozef Gašpierik, which was organized in cooperation with Flow East, who has provided the space for artists on the occasion of the company’s 25th anniversary. Part of the closing ceremony for the c exhibition, “Return of the Lost Son,” was an intimate concert given by Norbert Peticzký, a finalist of the Hlas ČeskoSlovenska competition, in the wonderful Gothic chapel, which dates back to the 12th century. Because of the exhibition’s popularity, the organizers have decided to extend it until 22nd October. The public now has another chance to visit the exhibition for free. 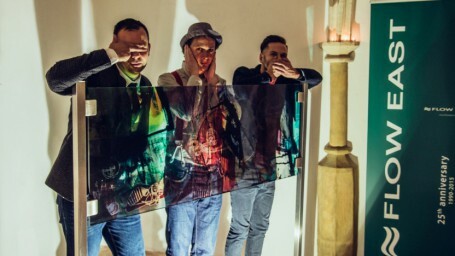 The well known artist, painter and photographer, Luka Brase attracts visitors not only for his unique paintings on glass, which he has created with Jozef Gašpierik, but also for other works showing the journey of his life. In addition to the connection between the beautiful works with the building’s strong history, taking place in this space is also the beginning of a new project, the Flow East Art Hub. It provides artists’ studios for free. Currently, there are more than 40 applicants. An evaluation is planned for the end of October.